Police and Peace Officers’ National Memorial Day | Bonnie Reilly Schmidt, Ph.D.
On Sunday, September 27, 2015 memorial services honouring police and peace officers who have lost their lives in the line of duty will be held across the country. The Canadian government first designated the last Sunday of September of every year as Police and Peace Officers’ National Memorial Day in 1998. The intent of the day is to give Canadians the opportunity to express their appreciation for those who work to keep their communities safe. A ceremony will also be held at the national police memorial in Ottawa, Ontario. The memorial consists of a wall of glass panels positioned along the perimeter of Parliament Hill and overlooking the Ottawa River and the Supreme Court of Canada. As of 2015, the names of over 850 men and women who have lost their lives in the line of duty have been engraved on the panels. The day is also designed to give police and law enforcement officers the opportunity to collectively remember their colleagues who have died. Official marches to mark the day will be similar to those that have taken place during police funerals. 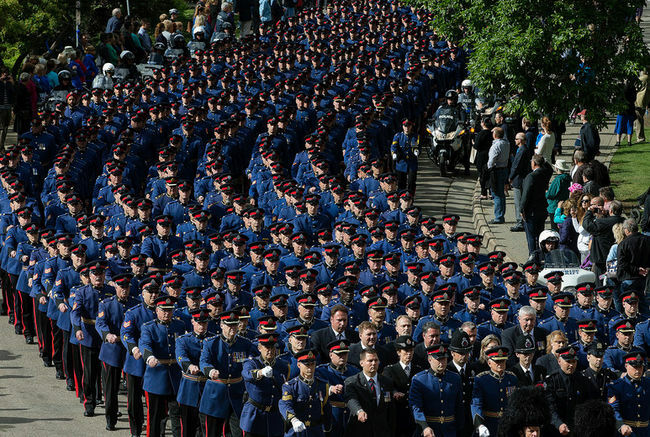 Traditionally, regimental police funerals in Canada have been highly choreographed public rituals where police officers from across North America join together to march in formal dress uniform to the funeral service. The ritual reaffirms police solidarity and camaraderie but also reminds the public of the willingness of police officers to sacrifice their lives for the sake of their communities. Historically, the police funeral has sometimes served as a site of political protest. In the 1960s, for example, capital punishment was viewed by police organizations as a deterrent against the murder of police officers. When the government abolished the death penalty in 1976, police officers and their unions across the country protested. Since the RCMP Act prohibited RCMP officers from publicly criticizing the federal government regarding changes to the Criminal Code, Onofrey’s funeral served as a form of political protest against the new legislation. 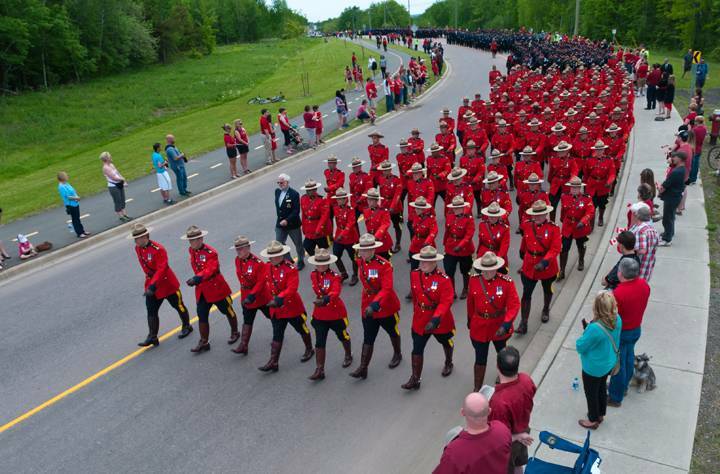 It was attended by 800 people, including police and law enforcement officers from across North America. Recently, police forces across Canada have come under intense scrutiny and criticism for the way they conduct their duties and handle members of the public. Sadly, lives have been lost on both sides of the many complex situations and issues in our society that involve police officers. Nevertheless, the Memorial Day presents us with the opportunity to remember that whatever the failings and shortcomings of the police in our communities, police work is the only occupation where public servants are most likely to die at the hands of their fellow citizens. It is also worth remembering that when police officers put on their uniform and go to work, they have no guarantee that they will be going home at the end of their shift. Greg Marquis, Policing Canada’s Century: A History of the Canadian Association of Chiefs of Police (Toronto: University of Toronto Press), 344. The last executions for first degree murder in Canada took place in 1962. Capital punishment was limited to the killing of on-duty police officers and prison guards in 1966. In 1976, capital punishment for first degree murder was removed entirely from Canada’s Criminal Code and replaced with a mandatory life sentence without the possibility of parole for twenty-five years. Robert Knuckle, Beyond Reason: The Murder of a Mountie (Dundas, ON: Kayson Publishing, 1997), 212.